What's your take on the online spying bill CISPA? CISPA is a bill that is worth reading about. In this article, I recommend several reliable sources for information. I'm wondering what you think of CISPA, an online spying bill for the internet where the private sector can send your private data to the government or to other businesses: everything from your email, texts, and so on. And do you think it will work? In this excerpt from Answercast #18, I look at a bill being proposed in the United States and give sources for finding up-to-date information. Do I think it will work? It depends on what you mean by "work." If the thing passes, then obviously it will work for all those businesses and companies and the government who want access to all of that information. I'm not totally convinced of the benefit; and I'm very scared by the potential cost in the intrusion into our lives and privacy. I certainly have not researched the bill sufficiently to offer you what I would consider to be a qualified opinion. That being said, several organizations that I do respect have taken some strong positions against these kinds of cyber spying bills as they've come along. CIPA (Children's Internet Protection Act) being the one that came up last year. It is something that I think we, as internet users, need to become aware of and make sure that our opinions here in the United States are shared with our government representatives. Typically, that means the House of Representatives, or the Senate, or both; as in fact, for such a bill to become law, I believe both have to act on it. What I want to do is point you to three articles on CISPA that I think would be worth your spending a little time researching. I'm going to give short links off my own redirectors because in many cases, the URLs for these pages are actually quite lengthy. Most of the information you'll find there is supportive of the bill because it's been written and provided by the sponsors of the bill. This is an article out at CNET.com entitled, "How CISPA would affect you." It's an FAQ basically. It's in a question and answer format covering much of what CISPA does and does not do. 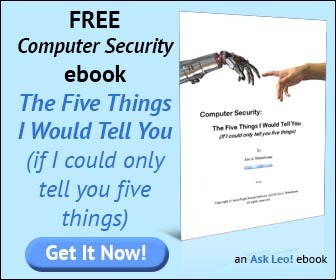 This is an article from PC World and it is entitled CISPA: Four viewpoints you should hear. The importance of this one is that it also includes the EFF's position. The EFF is the Electronic Frontier Foundation. They're a non-profit organization dedicated to keeping an eye on what organizations and government are doing with respect to the internet: freedoms on the internet, privacy, security, and so forth. The article actually has both pro and con viewpoints on CISPA, so it's a great starting point; a good jumping off point for being able to form your own opinion, pro or con, on what this legislation would entail. And lastly, I'll just throw in plug for the EFF in general, EFF.org. They are an organization that I personally support. By support, I mean I make some donations to them periodically. The interesting thing about the internet is that it is in many ways still all being discovered. We're still all 'kinda making this up' as we go along. That includes laws and court cases and decisions that typically may seem like they're only about one particular issue or a specific event; but in fact they end up setting precedence for larger issues like: your online privacy, your online access to open information and so forth. So they're an organization that I support. If continuing to keep an open internet is of interest to you, I might suggest you at least check them out as well. So, like I said, I'm not going to give you a strong "yea" or "nay". My gut feeling says this CISPA is evil; it's mostly based on hearsay from some of the other organizations that I've just listed. I strongly recommend that you go out and have a look at the information that's out there on CISPA and then make your opinions known to your appropriate representative in government. I realize that this is mostly for my listeners in the United States. That's where this bill is happening, but there are certainly similar issues planet-wide, worldwide, and I think that it's something we all want to be paying attention to; and keeping an eye on. Next from Answercast 18 - What IP address do I put in my browser to secure my router? Is Big Brother Watching You? Reports are that law enforcement is asking ISPs to keep records longer. Should we worry? Can my employer track what I'm doing on the internet? If you have to ask, you probably don't want to know. I thought my posts were private/anonymous/protected? Google was forced by court order to reveal the identity of an "anonymous" blogger. It's worth understanding the risks that this implies. Can my ISP monitor my internet usage? Your ISP controls your internet connection and it's easy for them to monitor the data you send and receive. The question is, why would they bother? I personally believe that any broadcast information, whether by internet ( email or web browsing ) or radio ( including mobile calls), should be treated as in the public domain, so there is no privacy issue here. If you want to keep something private then do not broadcast it! The big problem is cost - how much taxpayers' money is going to be spent on this? That is the issue. If such a bill is passed there should be a maximum annual cap on the amount included. I guess Eric envisions the US as a police state wherein privacy has no place in society, even during phone calls. Interesting that his only concern is the potential monetary cost. I sure am glad Eric's not in charge of anything. Eric, it's annoying when people make your comment. Apparently you do not do any sort of banking online. Also assume you don't make telephone calls (I'm not talking VOIP), because a majority of them are routed through internet lines by the phone companies at some point to their destination. Also assume you don't shop in stores, have a bank account, or basically leave your house because every third party you interact with in the real world keeps online data of you. According to you this is free game for all of us to use in the public domain. Broadcasts have never been public domain is regards to being rebroadcast. If they had been, they would have been mostly created by amateurs who had no interest in recouping their investment. Intellectual property protection has allowed America and many other countries to get investors to invest in building and developing very high levels of cultural productivity that employs millions. There has never been a right to privacy regarding enabling people to illegally duplicate and rebroadcast intellectual property without permission. The people that advocate for this like the EFF and Public Knowledge are funded by the search engines, ISPs and internet ad networks that profit from eliminating intellectual property protections. To be clear, the EFF does not promote, condone or support illegal piracy. What the do support is protection against governments and corporations using copyright and cyber-terrorism as excuses to over-reach and curtail basic rights and policies such as fair-use, privacy and more. It's probably obvious that while I may not agree with every single action they've ever taken I do support the EFF and beleive that what they do is important in safeguarding individual rights. By the nature of what I do (online publishing) I'm a strong believer in copyright and intellectual property rights, but that's not at all incompatible with individual rights as well.